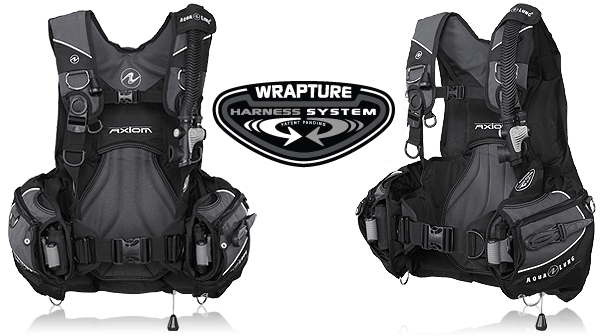 The Wrapture™ harness system, using the shoulder swivel buckles (patented), valve retention strap and a customized back plate, provides comfort and stability while preventing "ride-up" at the surface. The GripLock™ tank band system makes attachment to a cylinder easier than ever before. Gone are the days of complicated web weaving and you don't have to worry about pinching your fingers with the innovative finger saver feature (pat. pend.). Uses a super streamlined air cell design making it one of the most streamlined jacket style BCs in the world. The low profile flat valves reduce drag when moving through the water. SureLock II weight pouches (patented) provide a simple, single-pull release. Loading is as simple as insert and "click". Fixed pockets on the tank band increase weight capacity and help provide proper trim in the water. A bladder retraction system is used to pull in the sides of the bladder during deflation. The chest strap can be adjusted for personal comfort. A scooped octo-pocket on the top, front of the right lobe makes it easy to stow and deploy an octopus. The octopus remains visible and accessible throughout the dive. Some divers may find it useful to run their instruments behind the left pocket and out the scooped opening on the top, front of the lobe. Large, easy-to-access, utility pockets found on either side of the Axiom are secured with zippers. Knife attachment points are found on the left lobe. Large pull bobs are easy to find and grip. Features 5 stainless steel D-rings and 1 plastic D-ring for all of your accessories. Right shoulder pull dump is easy to locate and use. Rolled neck collar for comfort.